This is the week leading up to Valentine's Day and Dennis' and my sixth wedding anniversary. The theme of our wedding was JOY. Joy in every day we're given. I think that's why this photo from our wedding is my favorite. 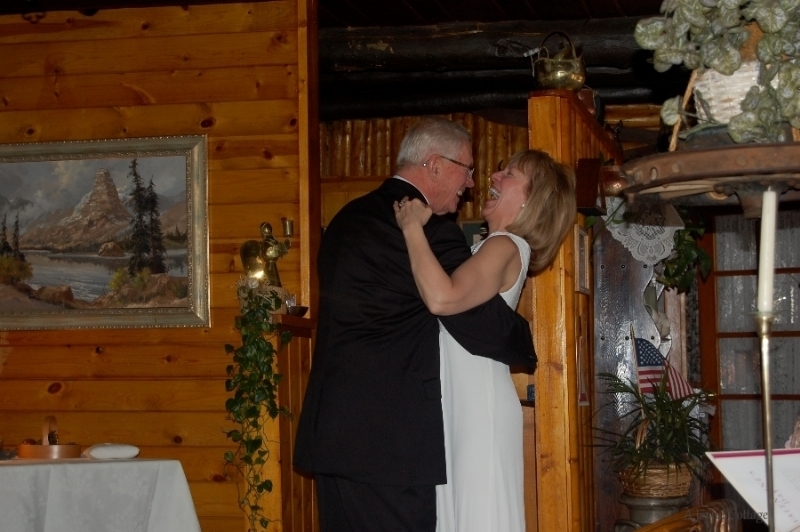 When I look at the two of us dancing I relive the pure joy of beginning life as a couple. There have been days when that joy has been threatened. Remarrying at our age comes with a whole different set of challenges than did the marriages of our youth. Six years into my marriage to Dennis I'm still learning how to appreciate our differences, to accept them as an opportunity to grow as a person; to become more of the woman God designed me to be. Embracing the green chair has been part of my education. What in the world is she talking about? That's probably what you're thinking right now, so let me explain. Last summer, just before we moved into our new cottage, we spent a day in Pendleton, Oregon browsing through antique and vintage shops. Dennis discovered a green wing back chair without a price tag and asked the shopkeeper about it. She had just received it on consignment and planned to list it for sale once it was "cleaned up". However, if we were interested, she'd make us a deal. Dennis sat in the chair and immediately decided he wanted it if the price was right. It was. The shopkeeper offered to sell it "as is" for $35, and we bought the chair. It was a great buy; a very good quality chair, made in North Carolina and sold in high-end retail shops. A professional woman in Portland (a friend of the shopkeeper) had owned the chair and it was in exceptional condition. I wasn't crazy about the outdated upholstery, but reasoned I could always have it reupholstered, or use a slipcover. Except that's not what happened. Dennis liked the upholstery. He liked the emerald green color. He liked the variegated gold trellis pattern. And he wasn't at all anxious to change it. He never told me I couldn't change it, but a wife knows when her husband really isn't onboard. It's part of that history thing. One day my friend Mary stopped by for coffee. I showed her the chair and shared my feelings about the upholstery. She smiled sweetly and said, "I think you should embrace the chair. It's pretty and you can work it into your decor." This photo was taken in the fall. I'm thinking about making some changes for spring. New fabrics for the stool, sofa cushion and pillow covers. Something softer. Pastels maybe. Whatever I choose I'll make it work with the emerald green chair and its variegated gold trellis. Because that's my husband's chair and he's happy with it. And because I love my husband I'm embracing the green chair. Honestly, it's grown on me. The chair is now part of our history as a couple. It represents to me the acceptance and appreciation of the differences between my husband and myself. It represents honoring my husband, showing him respect and feathering our nest in a way that pleases both of us. . .
easily angered, it keeps no record of wrongs. I have learned to embrace some of The Great Dane's beloved things and after 42 years it is still sometimes a challenge. I'm glad, though, that there are still enough differences to keep things interesting!! Congratulations on your anniversary. The photo is absolutely beautiful and a perfect illustration of your theme of JOY. Sweet photo of you two. Nancy, a lovely post which warms my heart. I think you must be more tolerant than me. Poor Bob doesn't always get his way with me when it comes to decor, furniture, haha! But, that said, he is not a creative/visual person, which of course your wonderful artist Dennis is! Bob doesn't mind though, as long as things are comfy, he leaves the rest up to me. 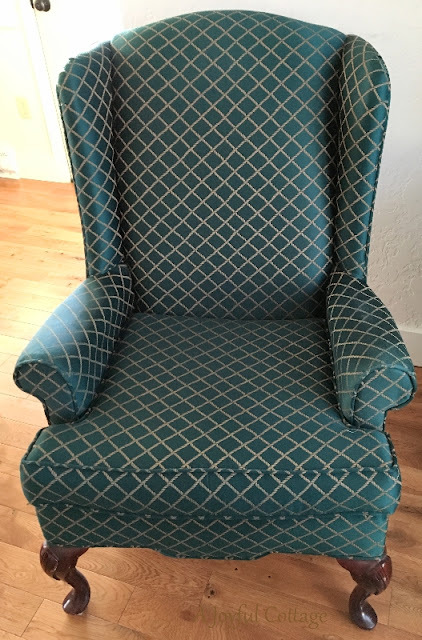 Regarding a man's chair, that is important in a home, and Bob did get a new leather recliner a few years back - that was quite a stressful time because he really wanted to hang on to his old one - which I disliked immensely and was falling apart! We shopped together for that piece - I think it's OK for a bulky chair, Bob still grieves for the old one, enough said! Congrats on your anniversary - lovely photo. As for the green chair - love a classic Queen Anne wingback, can't go wrong with that style - and it's looking really good in your room. Happy Early Anniversary. I adore the chair color and all, but I do understand what you are saying. Hubby had a recliner that he loved in our second home and over time I hated it and wanted to get rid of it. Over 18 years can do a number on a chair and it did on this one. Lucky for me when we moved into this house Hubby wanted all new living room furniture and he said it was time to say goodbye to the old recliner. Hi Again Nancy, (this has been a correspondences day for us, LOL) You are so wise. It is the little things like a chair or in our case the way Steve arranges his spot in the living room, that can spoil a otherwise great relationship. Life is too short to not bend and grow and flow with love. I truly enjoyed reading this post, it is a reminder of what love is all about. With green being a color of nature and the fact that the chair is a classic and very well built . . . well, that is certainly a plus. There should be a lot of ways to tie it into any design you come up with . . . it really is a nice chair. I love the photo of the two of you . . . that smile on your face says volumes, Happy Anniversary! Happy Anniversary. It's all about compromise isn't it. My husband won't let me get a new dining room set. Well he isn't actually not letting me. I want a more of a flea market look. The place of the wedding photo reminds me of where my daughter got married in Estes Park. Happy Anniversary to you and your hubby. I love the picture of you two. Such joy on your faces. Thankfully for you, the green chair looks nice and it was in good condition when Dennis found it. Not always the case with some couples I know. I can't wait to see what changes you make that still include the green chair you've embraced. In the big picture of life it's really a small thing. I have to keep reminding myself of that, too. Nancy, I know exactly what you're talking about! My second husband & I have been married now almost 13 years (He proposed on a Feb 14th). It was definitely a new beginning, a new history as opposed to my previous 20 yr marriage and history. I think embracing that chair will be more terrific as the years go by. It's certainly worth the joy, isn't it? A most Happy Anniversary and continued life together is wished for you! Such a sweet story. Thanks for sharing. I love this post and its message - the concept of "embracing the green chair" could translate to other objects or hobbies. Compromise is what makes a marriage strong. Great wedding day photo - Happy Anniversary. I need this "embrace the green chair . . ." reminder . . . often! Compromise, communication, consideration . . . play their role, don't they . . . Happy Anniversary . . . I love your 2010 dancing photo . . . Yes, it's about 'us', green chairs and all. He's gotta have 'that desk'; I've gotta have 'that comforter'. But most of all, we've gotta have each other. Desks, chairs, and comforters will burn; our love endures. This is a beautiful message, Nancy. I could definitely work on "embracing the green chair" within my marriage and family. Thank you, Friend. That scripture never fails. Never. This scripture must be engraved into my heart for I fail it, always. BUT we are stories, like that chair. Our stories always involved highs and lows, just like a well-written story. Nancy, that chair represents so many things. You have however, worked it in BEAUTIFULLY with that darling little green table, the red in the other chair, and the softness of the room. IT WORKS. And then something miraculous happens (this has happened to me) - the piece grows on you. It starts to fit in, just like maybe that person who once annoyed us, who once was too harsh or didn't "fit in". Love changes everything. You are a wise woman! Your choice to embrace the chair speaks volumes to your husband and your audience and to who you are as a woman of God. You can make it work in the room...it is not that bad :-) I started ripping the wallpaper off the dining room walls the other day and told my husband I didn't know what I was thinking to start it. He said he has learned to trust what I do in the decorating of the house. I asked him what he would do and he said plaster the walls with Marvel characters! Okay, that is not going to EVER happen and I think I am being wise to put my foot down on that! I totally agree with you about all you have to learn in a second marriage. Mine will reach 20 years this summer! Oh, duh! I just looked at the picture again and realized you were married on Valentine's Day. Happy Anniversary!!! How sweet. What a lovely post and story. Life and love are about learning, adjusting, encouraging, growing, forgiving, having fun. I like the green chair and I know how comfortable a chair like that is. Oh Nancy! 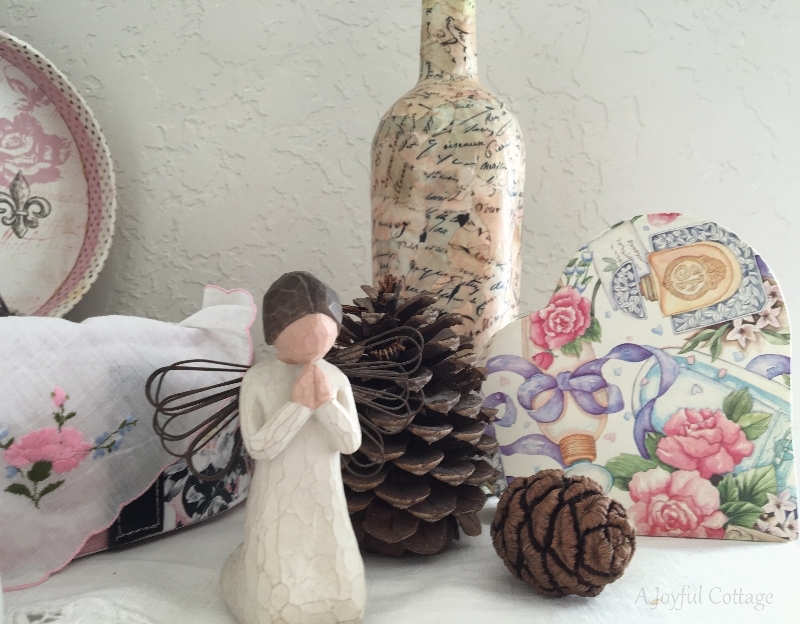 All of our hearts are nodding in unison as we read this post....we always have the option to stamp our feet and throw a fit to get our way---but the beauty of the struggle of dying to our self-focused wants--is that we not only learn how God wants us to live out love by his example, with tremendous patience--but that we eventually arrive at something even better than we imagined wanting in the first place. Thank you for sharing. What a sweet photograph of you two, telling all the love you've begun to embrace as a couple ! as so very special I'm sure is every day of yours ! Love the chair Nancy. I bet it if very comfy. Hey life is short we need comfy!!!! Love the pic of the two of you. So sweet. Happy Anniversary and Happy Valentines Day. What a wonderful post! I love the joyful picture of the two of you--that's what ALL wedding pictures should look like! :-) We all definitely bring something to our relationships that others must learn to embrace. Thank you for sharing such wise words this Valentine's week. Happy anniversary to you both! I enjoyed your story of the emerald chair. Happy anniversary!! I know what you mean by "embracing the green chair" for we all have been there at one time or another in our marriage. In the end we look at what is really important in life. Great post. Wishing a wonderful Valentine's Day! What a lovely post, Nancy, wise and inspirational. And I loved seeing you so happy in the photo. Happy Anniversary. this is probably by far one of my favorite posts of yours, nancy. 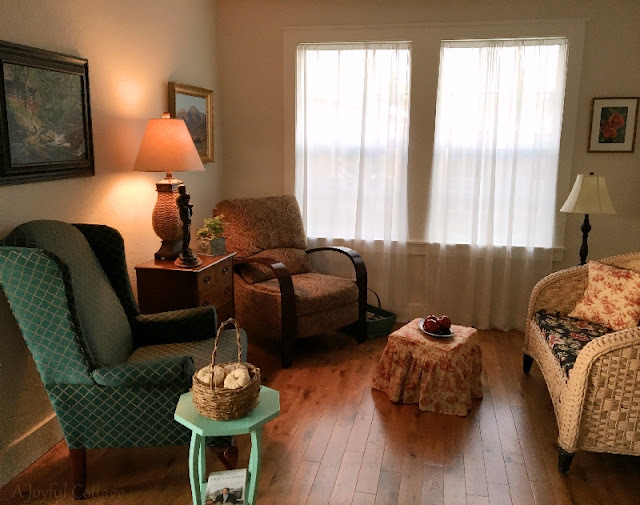 my husband and i read it together, after i showed him your new post with a new cottage (seattle) which we both swOoned over and saw many possibilities of inspiration. your green chair post brought affirmative nods from clark, and chuckles from both of us as well. i read aloud the part of your post that read "it's grown on me." to which i responded out loud, "yeah, like mold." all in jest. but this has me thinking .. hm. do i embrace or reject the Jeep grill picture my husband loves, enough to showcase it on the living room wall? i think not. wink. big hugs. I like this post, it has a lot of wisdom in it. I like the quote too. I remember reading it somewhere before and thinking I must remember that! A lovely post! So true. Jeremy and I will be married 19 years this May 31st. And yes, we need to give and take. We also had 1 Corinthians 13 4-8 read at our ceremony. And that's a lesson even those of us who have been married five decades should learn! I think the green chair is beautiful, now if I could learn to feel that way about the humongous antique roll top desk that my husband bought in 1963. I can't say that I've ever truly accepted it! Happiest of happy anniversaries, Nancy! What a wonderful lesson you learned from the green chair. Sometimes it can be a challenge balancing each other, but it is worth it as I think we enrich one another. Wishing you many more joy-filled years together!